The West-East Pipeline (WEPP) network is described as the largest and most significant gas industry project ever planned in China. Intended for the development of the western regions in China, the project involves construction of four gas pipelines connecting the eastern markets of China with the western resources. Thousands of kilometres of pipelines travel along varied terrains such as plateaus, mountains, deserts and rivers to connect the Tarim Basin in Xinjiang Autonomous Region and Turkmenistan with the Yangtze Delta and Pearl Delta regions. Basin gas fields in Xinjiang to the Yangtze River Delta area for the production of electricity. In 2008 construction began on a second pipeline, in part running parallel to and interconnected with the first. 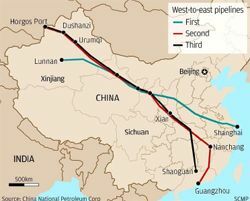 The second pipeline runs from Xinjiang to Guangzhou and is being followed by two further pipeline developments, all designed to supply billions of cubic metres of gas to satisfy the burgeoning demand for energy in China's industrial and population centres. Construction on the second pipeline (WEPP II) started in February 2008 and groundbreaking for the third pipeline (WEPP III) took place in October 2012. WEPP IV is still in the planning stage. IQ3 actuators incorporate an absolute encoder, shown on the right. The worm shaft above is utilised for accurate measurement of actuator output torque. From the very beginning, electric valve actuation utilising Rotork IQ intelligent non-intrusive technology has been adopted throughout the project. 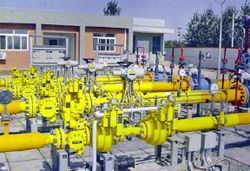 For over a decade, thousands of these actuators have been installed during all stages of the project for valve control at compressor stations, manifolds and storage facilities. to copy the original design. 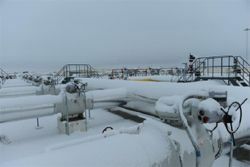 At the time, Rotork was the only manufacturer to offer non-intrusive setting, commissioning with data logging and data transfer technologies in actuators that were already proven in the international oil and gas industries. The IQ actuator had pioneered nonintrusive data communication by means of an infrared link to a hand held setting tool when launched in 1993 and by 2000 the IQ was accounting for the majority of the company's worldwide electric actuator sales. settings. The data can also be downloaded on to a PC, fine-tuned or adjusted and then re-transmitted via the hand tool to the actuator. minimised. Data can be downloaded by the hand held setting tool or with a laptop running the software directly linked to the actuator. In addition to pipeline isolating valve duties, intelligent electric actuators are also utilised for control valve duties at take-off stations that enable the gas to be transferred at a reduced pressure to downstream distribution networks. IQM modulating actuators control axial flow control valves in sizes between 100mm and 250mm. electrics are protected when the terminal cover is removed. As a result, actuators with the highest certification for hazardous area operation also feature a robust, watertight and temporarily submersible enclosure approved to IP68 and the equivalent international standards. The 4000 kilometre length of the first pipeline is less than half of the total length of the second pipeline and its eight branch lines. Similarly, the 17 billion cubic metre annual capacity of the first pipeline has been eclipsed by the 30 billion cubic meter capacity of the larger bore second pipeline. installations and control protocols. Further advances to data logging, display and communication capabilities have been introduced in response to the recognised desire from end users to access even more data, both in the field and in the control room. Included in the list of developments, there are three key features of the IQ3 design that are particularly important for long term reliability, low maintenance and low cost of ownership. addition to local position indication it also provides a graphic interface to assist set up and calibration and it displays - at the valve - critical performance data in relationship to actuator performance that allows a user to determine the service condition of the valve or predict when a problem may occur. depending on the information that the operator wishes to see at all times, including diagnostic graphics, simultaneous demand and position, torque and position and actuator settings. Valve position is displayed to one decimal point, offering accuracy and resolution for diagnostic analysis. Diagnostic graphics offer a window into the process showing the valve torque graph and facilitating analysis of the situation in real time. 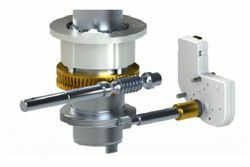 Second, the accurate measurement of the actuator output torque is a function provided by the worm and wheel. The axial force of the worm shaft is always proportional to the torque produced by the worm wheel and this is not affected by changes in the efficiency of the gearing caused by long-term operation. The torque is measured by a force transducer rather than disc springs or any other mechanical devices that can wear and change their characteristics over time. This is very important for asset management, as the torque profile of the valve operating stroke is recorded by the actuator data logger as a ‘footprint' during commissioning and subsequently recorded during every valve operation. This data forms a crucial part of the information that can be used for maintenance planning. disadvantage is that they add complexity and can reduce reliability. 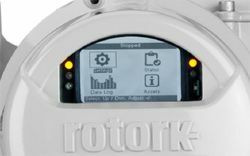 A Rotork actuator menu screen. The actuator’s local position indicator window has been transformed into a window into the plant process.